The address of The Harold Pinter Theatre is Panton Street, London, SW1Y 4DN. The theatre is situated opposite The Tom Cribb pub. 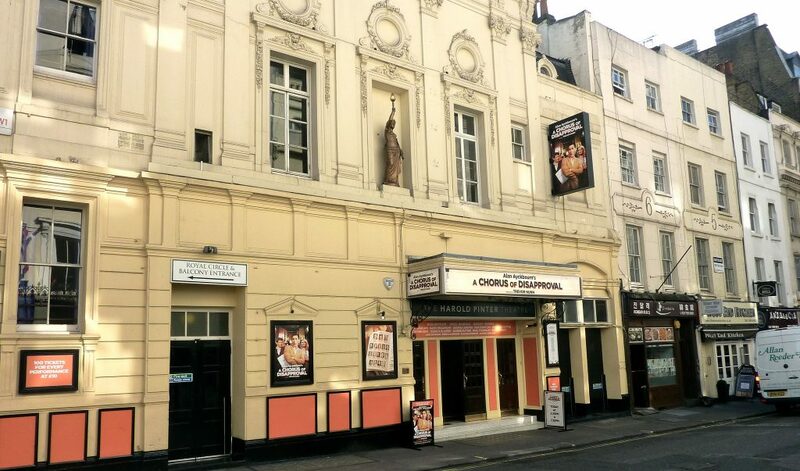 If you are arriving by car you can be dropped off on Oxendon street which runs down the left hand side of the building, or on Panton Street itself directly outside the entrance to the theatre. Please note these streets operate a one-way system. There is no parking on the roads immediately around the theatre. Masterpark carpark in Whitcomb Street has 2 reserved disabled parking spaces. There are 5 bays for disabled badge holders in St. Martin’s Street, which is off Orange St. behind the National Gallery. If you are travelling by bus, Route numbers: 3, 6, 12, 13, 23, 88 and 139 all stop on Haymarket. Walk up Haymarket and take the first right onto Panton Street. The theatre is located about 40 metres on the right hand side. The nearest tube station is Piccadilly Circus. Leave the station by the Haymarket exit. Walk south down Haymarket until you get to the zebra crossing, which is about 50 metres down. Cross over Haymarket and take the next left into Panton Street. There is a taxi pick up point outside the Trocadero on Piccadilly Circus. The main entrance to The Harold Pinter theatre has two steps up to two sets of glazed doors. These are generally pinned open prior to a performance. Once inside, the Box Office is straight ahead, with entrances to the Dress Circle and Stalls on either side of it. The foyer bar is to the left. You can collect your headsets, as well as large print and Braille cast lists, from the cloakroom. Please ask the member of staff standing at the doorway to the right of the box office to direct you. If you would like to listen to the introductory notes 15 minutes before the start of the performance, you should collect your headset in good time to take your seat. Ladies and Gents toilets are located down 23 steps from the foyer to Stalls level, or up 23 steps from foyer to Royal Circle. Our Royal Retiring Room toilet is located 6 steps down from foyer level, for patrons with limited mobility. Alternatively, Strada restaurant opposite the front of the theatre on Panton Street offers the use of their accessible toilet. A member of theatre staff would be available to accompany patrons to and from the restaurant. The Dress Circle has level access directly from the foyer. The entrances are to the right and left of the box office. For the Royal Circle and Balcony the entrance is to the far left of the foyer. The auditorium seats approximately 800 people on 4 levels. It’s decorated in light blue and gold, in a traditional ornate style in keeping with the period it was built, 1881. The seating is arranged in one block, with aisles either side, apart from the Dress Circle which is arranged in three blocks. The seats are flip up. There are 4 wheelchair spaces in the Dres Circle. Please notify the theatre beforehand if you require an access ramp at the main entrance. Guide dogs are welcome at The Harold Pinter Theatre. If you wish to bring your dog into the auditorium please let the theatre know in advance, if you have not already done so. If you do not wish to take your dog into the auditorium, theatre staff are able to look after your dog during the performance. If you are bringing a guide dog, and you have not already advised the theatre, please contact Andrew Wright on 0207 321 5312 or leave a message with Stage Door on 0207 321 5300. You can also call these numbers if you require any further information about your visit, or alternatively you can contact the Access Centre on 0844 871 7677.